From Springfield travel east on the McKenzie River Highway (Oregon Highway 126) for about 25.5 miles. Goodpasture Bridge is on Goodpasture County Road at Highway 126 just east of Vida. The Goodpasture Bridge is one of the most beautiful and most photographed covered bridges in the state. Designed by the State Highway Department and built by Lane County, the classical and timeless architecture of this bridge is accentuated by Gothic style windows on both sides of the structure. 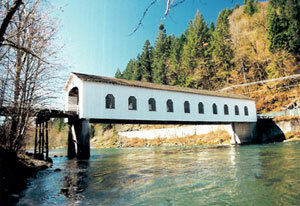 At 165 feet, the span is the longest covered bridge in Oregon still in daily use. Lane County spent $13,154 constructing the Goodpasture Bridge and is still reaping the benefits of a good investment. Unfortunately, both time and traffic have significantly weakened the span. By the early 1980s, rumors persisted that the Goodpasture Bridge would be closed with a new concrete span built to handle the local traffic. Instead, Lane County agreed to repair the bridge, and work was completed in 1987 which included renovation to handle the daily loads of log trucks. In addition, the remodeling included a right-turn lane for traffic exiting Highway 126 onto the bridge, and a concrete retaining wall along the north bank of the McKenzie River. Some $750,000 was spent to complete work on the bridge, road, approaches and wingwall. The Eugene Register-Guard reported that Ole Halverson, who helped built the bridge in 1938, attended the dedication in April 1987 and liked what he saw. "They did an excellent job of strengthening it," Halverson said. "It looks the same as new." The nearby town of Vida was once called Gate Creek, resulting in confusion with Gales Creek in Washington County. "Vida" was selected as an alternate name because it was also the name of the daughter of postmaster Francis Peport. The Goodpasture family settled near the town of Vida and gave their name to the bridge.